Closer view of red oncom mold. Oncom cooked as pepes dish. Oncom /ɒnˈtʃɒm/ is one of the traditional staple foods of West Javan (Sundanese) cuisine, Indonesia. There are two kinds of oncom: red oncom and black oncom. 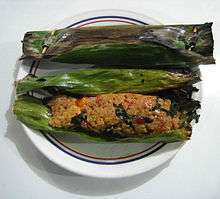 Oncom is closely related to tempeh; both are foods fermented using mold. Usually oncom is made from the by-products from the production of other foods: soy bean tailings (okara) left from making tofu, peanut press cake left after the oil has been pressed out, cassava tailings when extracting the starch (pati singkong), coconut presscake remaining after oil has been pressed out or when coconut milk has been produced. Since oncom production uses by-products to make food, it increases the economic efficiency of food production. Red oncom has been found to reduce the cholesterol levels of rats. 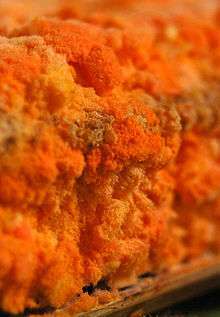 Black oncom is made by using Rhizopus oligosporus while red oncom is made by using Neurospora intermedia var. oncomensis. It is the only human food produced from Neurospora. In the production of oncom, sanitation and hygiene are important to avoid contaminating the culture with bacteria or other fungi like Aspergillus flavus (which produces aflatoxin). Neurospora intermedia var. oncomensis and Rhizopus oligosporus reduce the aflatoxin produced by Aspergillus flavus. However, aflatoxin-producing molds (Aspergillus spp.) are often naturally present on peanut presscake. Furthermore, coconut presscake can harbor the very dangerous Pseudomonas cocovenenans, which produces two highly toxic compounds - bongkrek acid and toxoflavin. Shurtleff and Aoyagi address toxicity in their book section on oncom. 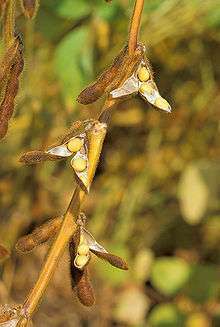 While it is known that soybeans are the best substrate for growing R. oligosporus to produce tempeh, oncom has not been as thoroughly studied; the best fermentation substrates for producing oncom are not yet known. ↑ Ho C.C. 1986. Identity and characteristics of Neurospora intermedia responsible for oncom fermentation in Indonesia. Food Microbiology 3(2):115-132 (April 1986). Also, There is an appendix on oncom in Aoyagi and Shurtleff's _Book of Tempeh; Professional Edition_, online at Google books.